A kitchen worktop upstand is used to cover the join between a work surface and an adjacent wall. 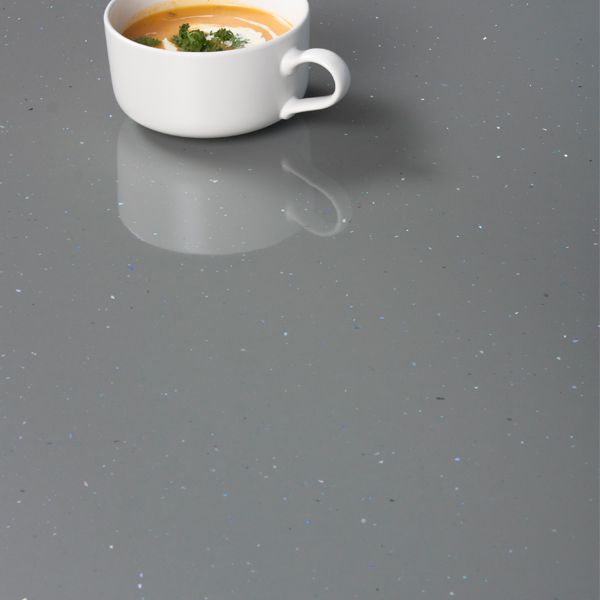 This grey sparkle laminate worktop upstand is a fantastic alternative to tiling right to the countertop. An elegant option for any kitchen, this upstand is wrapped in the same decorative laminate as our grey Andromeda worktops. This gloss laminate work surface upstand is manufactured in the same way as our laminate tops. A fibreboard core is wrapped in grey sparkle laminate decorative film which is bonded through the application of heat and pressure. Easy to clean and low maintenance, this worktop upstand is the perfect way to create a seamless look throughout your kitchen.